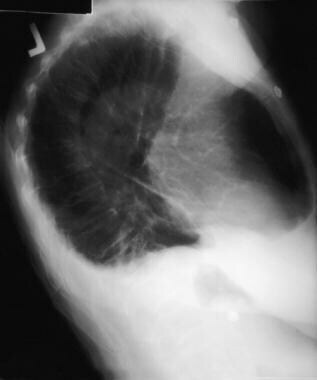 Anteroposterior upright chest radiograph shows a massive left-sided pleural effusion with contralateral mediastinal shift. Image courtesy of Allen R. Thomas, MD. Left lateral decubitus chest radiograph shows fluid layering on the left side, which is not a loculated effusion. Image courtesy of Allen R. Thomas, MD. Most commonly, a pleural effusion is an incidental finding in a stable patient. Prehospital interventions are generally limited to patients who are in respiratory distress or are hemodynamically unstable. As with any other life-threatening condition, initial management is directed at ensuring adequate oxygenation and ventilation. Oxygen should be administered to all unstable patients. After airway stabilization, the patient's circulatory status should be assessed and supported as indicated. Diagnostic procedures include percutaneous pleural biopsy, bronchoscopy, thoracoscopy, and open pleural biopsy. Strict precautions are required in the handling of needles and bodily fluids, including pleural fluid. Reports exist of human immunodeficiency virus (HIV) transmission from needles contaminated with pleural fluid. The distinction between transudate and exudate is generally made by measurement of serum and pleural fluid lactate dehydrogenase (LDH) and protein concentrations. Cell count with differential -­ A nucleated cell count less than 1000/μL suggests a transudate, whereas a count greater than 1000/μL suggests an exudate. Glucose level -­ A level less than 60 mg/dL suggests complicated parapneumonic effusion or an effusion due to malignancy, tuberculosis, or rheumatoid disease. Cytologic analysis ­- Especially if malignancy is suspected. In the appropriate clinical setting, Gram staining, acid­-fast bacilli staining, and culture and sensitivity for aerobic and anaerobic organisms and fungi. Additional studies should be requested on the basis of the gross appearance of the pleural fluid or when a specific condition is suspected. 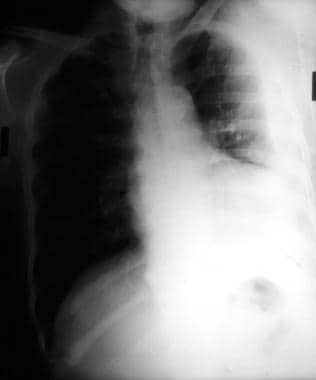 Posteroanterior upright chest radiograph shows isolated left sided pleural effusion and loss of left lateral costophrenic angle. Image courtesy of Allen R. Thomas, MD. Anteroposterior upright chest radiograph shows bilateral pleural effusions and loss of bilateral costophrenic angles (meniscus sign). Image courtesy of Allen R. Thomas, MD. Chest radiograph, lateral view shows loss of bilateral posterior costophrenic angles. Image courtesy of Allen R. Thomas, MD. A lateral decubitus chest radiograph may detect as little as 5 mL of fluid. Additional findings suggestive of pleural effusion include homogeneous opacification or diffuse haziness with a ground-glass appearance, visibility of pulmonary vessels through the haziness, and an absence of air bronchograms. Massive effusions usually have an accompanying mediastinal shift to the contralateral side. In the absence of mediastinal shift, the differential diagnosis is narrowed to carcinoma of the ipsilateral mainstem bronchus with or without ipsilateral lung atelectasis, fixed mediastinum caused by fibrosis or tumor infiltration of the mediastinal lymph nodes, tumor infiltration of the ipsilateral lung, malignant mesothelioma, or complete atelectasis of the ipsilateral lung. 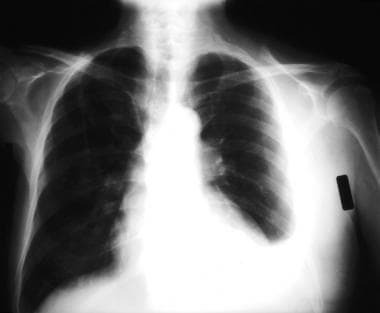 Chest radiography may yield other findings of value in determining the underlying disease process, such as pleural thickening or plaques, pulmonary parenchymal changes, or mediastinal enlargement. Diaphragmatic hernias can be excluded or confirmed with the administration of GI contrast material. 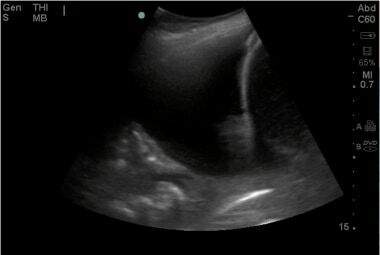 Ultrasound image of a large pleural effusion. Image courtesy of Michael A. Secko, MD. 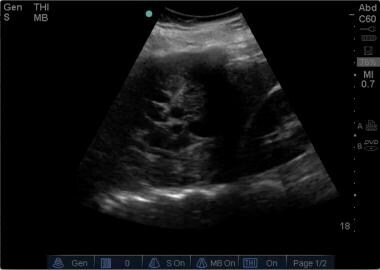 Ultrasound image of a large pleural effusion with associated pneumonia and atelectasis. Image courtesy of Michael A. Secko, MD. 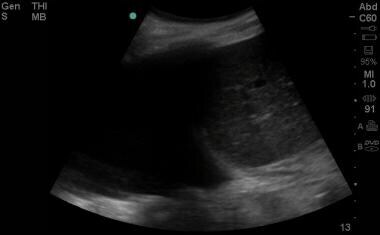 Ultrasound image of a loculated pleural effusion. Image courtesy of Michael A. Secko, MD. A spiral chest CT scan should be obtained for most patients with pleural effusion when the condition’s etiology cannot be readily determined or when complicated pleural effusion (eg, empyema, malignancy) is suspected. Scanning permits imaging of the entire pleural space, pulmonary parenchyma and vasculature, mediastinum, and pericardium. Abdominal slices may also be obtained if an intra-­abdominal etiology for the effusion is suspected. Chest CT scanning can help in distinguishing benign from malignant pleural involvement. One or more of the following suggests malignancy: circumferential pleural thickening, nodular pleural thickening, parietal pleural thickening (>1 cm), and mediastinal pleural involvement. Echocardiography may be performed to further assess patients with pleural effusion related to congestive heart failure or if pericardial effusion is suspected. Additional diagnostic testing is guided by the suspected etiology of the effusion and the patient's clinical status. Esophageal perforation is a medical emergency that requires rapid diagnosis and treatment. When this condition is suspected, contrast-enhanced studies of the esophagus should be performed (and surgical consultation should be obtained early in the patient's evaluation). In many EDs, helical chest CT scanning has replaced ventilation-perfusion (V-Q) scanning in the evaluation of patients with suspected pulmonary embolism. However, V-Q scans still have a role in some settings, including when a patient is not a candidate for a CT scan. After the presence of a pleural effusion is established, the cause should be identified. Diagnostic procedures include percutaneous pleural biopsy, bronchoscopy, thoracoscopy, and open pleural biopsy. However, thoracentesis and chest tube placement usually suffice for evaluation or treatment in the ED. Thoracentesis, which involves the removal of 50­-100 mL for laboratory analysis, is the first­-line invasive diagnostic procedure and can be safely performed in most patients, including those undergoing mechanical ventilation. Thoracentesis can also be used as a therapeutic modality, in which greater volumes of pleural fluid are removed to alleviate dyspnea caused by large pleural effusion. Most patients with a new pleural effusion should undergo diagnostic thoracentesis. However, clinically stable, afebrile patients with clear diagnoses (eg, congestive heart failure [CHF], recent thoracic surgery, or known renal or hepatic disease) may not require thoracentesis. In these cases, treatment of the underlying etiology may be appropriate. If the effusion does not improve or if the patient becomes symptomatic, delayed thoracentesis can be performed. For massive effusions with a midline mediastinum or ipsilateral mediastinal shift, consultation with a pulmonologist is indicated before any intervention. In such patients, bronchoscopy, rather than thoracentesis, is generally the initial diagnostic procedure of choice. On the basis of presentation in the ED, patients with pleural effusions may be (1) stable and require hospital admission, (2) stable and not require hospital admission, or (3) unstable. Generally, any patient who requires thoracentesis in the ED should be admitted to the hospital. 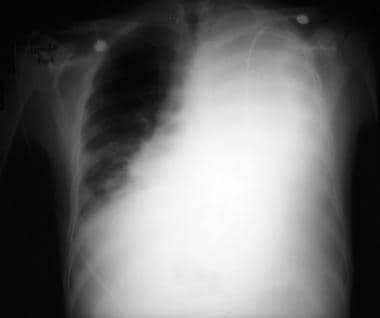 Stable patients who do not require admission include those in whom the clinical circumstances clearly explain the effusion, prior investigations of the cause were performed, effusions are typical of their disease and are asymptomatic, and diagnostic or therapeutic thoracentesis is not required. In such patients, thoracentesis is not indicated emergently and can be deferred. Therapy for the specific cause of the effusion, if indicated, should be initiated. If the patient does not improve after a few days, diagnostic thoracentesis should be performed. This assumes that the patient is reliable, has a stable social situation, and has a physician with whom to follow-up. Stable patients requiring admission include those with no prior history of pleural effusion, patients with parapneumonic effusions who do not appear to be septic, and patients with a prior history of pleural effusion whose condition has deteriorated. Although these patients are not in acute respiratory distress, diagnostic thoracentesis is warranted. This need not be performed in the ED if it can be performed promptly by the accepting inpatient service. When the cause of the pleural effusion is obvious, appropriate medical therapy should be initiated in the ED. For suspected parapneumonic effusions, appropriate antibiotics should be administered in the ED, including coverage for anaerobic organisms. Simple parapneumonic effusions have the potential to become complicated effusions or empyemas. Antimicrobial therapy alone is not sufficient for complicated parapneumonic effusions or empyemas. In these cases, prompt tube thoracostomy and antibiotics are required. Unstable patients include those in septic shock or respiratory distress or with hemodynamic compromise due to the effusion. The initial treatment focus should be on stabilization of the patient. Patients with dyspnea or severe respiratory distress should be placed on the gurney in an upright position, as this will increase tidal volume and decrease the work of breathing and may improve symptoms of congestive heart failure and/or pulmonary edema. Life-threatening traumatic or medical conditions (eg, tension hydropneumothorax, massive effusion with contralateral mediastinal shift, pulmonary embolism, esophageal perforation, traumatic rupture of the thoracic duct, strangulated diaphragmatic hernia) must be ruled out. These patients require immediate diagnostic and therapeutic thoracentesis. Tube thoracostomy is indicated for the initial management of empyema, diagnosed by the presence of pus on thoracentesis, a positive Gram stain, fluid glucose of less than 60 mg/dL, a pH of less than 7.20, or an elevated LDH level. Tube thoracostomy should also be performed on patients with hemothorax or pneumothorax. The chest tube tip should be directed posteroinferiorly to drain blood or pus and superiorly in the setting of pneumothorax. Other conditions, such as complicated parapneumonic effusion, chylothorax, or malignant pleural effusion, may require chest tube placement for definitive treatment. However, this decision should be made in collaboration with the admitting service. Placement of a chest tube in the setting of a malignant tumor that obstructs a mainstem or lobar bronchus is contraindicated, because the obstruction prevents expansion of the lung underlying the effusion. The patient's condition and the cause of effusion dictate whether admission to a regular floor or the intensive care unit (ICU) is required. Consultation with pulmonary specialists or surgeons may facilitate level-of-care issues. Depending on the patient's clinical condition and local consultation practices, the primary care provider, a pulmonologist, or, if indicated, a medical or surgical intensivist or general surgeon may be consulted. Follow-up with the patient's primary care physician or a pulmonary specialist within 2-3 days of treatment is advisable, especially if thoracentesis is deferred. If early follow-up seems unlikely, the patient should be given clear instructions to return to the ED in 2-3 days for reevaluation. Outpatient medication therapy is directed at the underlying etiology of the effusion. A social services professional should be consulted when a patient cannot afford prescribed medications. If the usual criteria for stability are satisfied, patients may be transferred to another facility for definitive care. If thoracentesis is performed, a follow-up chest radiograph should be obtained to rule out pneumothorax before transferring the patient. 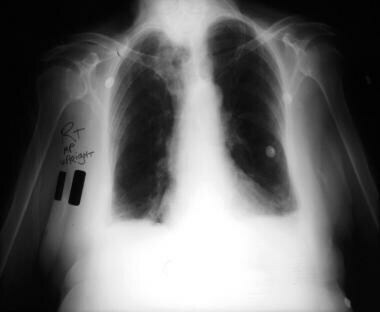 In the case of iatrogenic pneumothorax, a chest tube should be placed prior to transfer. Stable patients may be transferred by ground with proper personnel and chest tube in place. Diaz-Guzman E, Dweik RA. Diagnosis and management of pleural effusions: a practical approach. Compr Ther. 2007. 33(4):237-46. [Medline]. Light RW. Pleural effusions. Med Clin North Am. 2011 Nov. 95(6):1055-70. [Medline]. Wong CL, Holroyd-Leduc J, Straus SE. Does this patient have a pleural effusion?. JAMA. 2009 Jan 21. 301(3):309-17. [Medline]. Bishay A, Raoof S, Esan A, Sung A, Wali S, Lee LY. Update on pleural diseases - 2007. Ann Thorac Med. 2007 Jul. 2(3):128-42. [Medline]. [Full Text]. Noppen M. Normal volume and cellular contents of pleural fluid. Curr Opin Pulm Med. 2001 Jul. 7(4):180-2. [Medline]. Sahn SA. The differential diagnosis of pleural effusions. West J Med. 1982 Aug. 137(2):99-108. [Medline]. Qureshi NR, Gleeson FV. Imaging of pleural disease. Clin Chest Med. 2006 Jun. 27(2):193-213. [Medline]. Stigt JA, Groen HJ. Percutaneous ultrasonography as imaging modality and sampling guide for pulmonologists. Respiration. 2014. 87 (6):441-51. [Medline]. Tayal VS, Nicks BA, Norton HJ. Emergency ultrasound evaluation of symptomatic nontraumatic pleural effusions. Am J Emerg Med. 2006 Nov. 24(7):782-6. [Medline]. Hallifax RJ, Talwar A, Wrightson JM, Edey A, Gleeson FV. State-of-the-art: Radiological investigation of pleural disease. Respir Med. 2017 Mar. 124:88-99. [Medline]. Soni NJ, Franco R, Velez MI, Schnobrich D, Dancel R, Restrepo MI, et al. Ultrasound in the diagnosis and management of pleural effusions. J Hosp Med. 2015 Dec. 10 (12):811-6. [Medline]. Frankel HL, Kirkpatrick AW, Elbarbary M, Blaivas M, Desai H, Evans D, et al. Guidelines for the Appropriate Use of Bedside General and Cardiac Ultrasonography in the Evaluation of Critically Ill Patients-Part I: General Ultrasonography. Crit Care Med. 2015 Nov. 43 (11):2479-502. [Medline]. Wilcox ME, Chong CA, Stanbrook MB, Tricco AC, Wong C, Straus SE. Does this patient have an exudative pleural effusion? The Rational Clinical Examination systematic review. JAMA. 2014 Jun 18. 311 (23):2422-31. [Medline]. Sahn SA. The value of pleural fluid analysis. Am J Med Sci. 2008 Jan. 335(1):7-15. [Medline]. Zou MX, Zhou RR, Wu WJ, Zhang NJ, Liu WE, Fan XG. The use of pleural fluid procalcitonin and C-reactive protein in the diagnosis of parapneumonic pleural effusions: a systemic review and meta-analysis. Am J Emerg Med. 2012 Nov. 30 (9):1907-14. [Medline]. Izhakian S, Wasser WG, Fox BD, Vainshelboim B, Kramer MR. The Diagnostic Value of the Pleural Fluid C-Reactive Protein in Parapneumonic Effusions. Dis Markers. 2016. 2016:7539780. [Medline]. Ault MJ, Rosen BT, Scher J, Feinglass J, Barsuk JH. Thoracentesis outcomes: a 12-year experience. Thorax. 2015 Feb. 70 (2):127-32. [Medline]. Dixon G, Lama-Lopez A, Bintcliffe OJ, Morley AJ, Hooper CE, Maskell NA. The role of serum procalcitonin in establishing the diagnosis and prognosis of pleural infection. Respir Res. 2017 Feb 3. 18 (1):30. [Medline]. Gallard E, Redonnet JP, Bourcier JE, Deshaies D, Largeteau N, Amalric JM, et al. Diagnostic performance of cardiopulmonary ultrasound performed by the emergency physician in the management of acute dyspnea. Am J Emerg Med. 2015 Mar. 33 (3):352-8. [Medline]. Breen DP, Daneshvar C. Role of interventional pulmonology in the management of complicated parapneumonic pleural effusions and empyema. Respirology. 2014 Oct. 19 (7):970-8. [Medline]. Yamamuro M, Gerbaudo VH, Gill RR, Jacobson FL, Sugarbaker DJ, Hatabu H. Morphologic and functional imaging of malignant pleural mesothelioma. Eur J Radiol. 2007 Dec. 64(3):356-66. [Medline]. Adler EH, Blok BK. Thoracentesis. Roberts JR, Hedges JR, eds. Roberts and Hedges' Clinical Procedures in Emergency Medicine. 6th ed. Philadelphia: Saunders Elsevier; 2014. 173-188. Kirsch TD. Tube Thoracostomy. Roberts JR, Hedges JR, eds. Clinical Procedures in Emergency Medicine. 5th ed. Saunders Elsevier; 2009. 175-196. Roberts ME, Neville E, Berrisford RG, Antunes G, Ali NJ. Management of a malignant pleural effusion: British Thoracic Society Pleural Disease Guideline 2010. Thorax. 2010 Aug. 65 Suppl 2:ii32-40. [Medline]. Puri V, Pyrdeck TL, Crabtree TD, Kreisel D, Krupnick AS, Colditz GA. Treatment of malignant pleural effusion: a cost-effectiveness analysis. Ann Thorac Surg. 2012 Aug. 94(2):374-9; discussion 379-80. [Medline]. Janda S, Swiston J. Intrapleural fibrinolytic therapy for treatment of adult parapneumonic effusions and empyemas: a systematic review and meta-analysis. Chest. 2012 Aug. 142(2):401-11. [Medline]. Dhooria S, Singh N, Aggarwal AN, Gupta D, Agarwal R. A randomized trial comparing the diagnostic yield of rigid and semirigid thoracoscopy in undiagnosed pleural effusions. Respir Care. 2014 May. 59 (5):756-64. [Medline]. Kalantri S, Joshi R, Lokhande T, Singh A, Morgan M, Colford JM Jr, et al. Accuracy and reliability of physical signs in the diagnosis of pleural effusion. Respir Med. 2007 Mar. 101(3):431-8. [Medline].